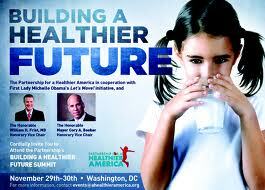 The Partnership for Healthier America’s Inaugural Conference; Building a Healthier Future, was held in Washington, DC in Novemeber 2011. The First Lady Michelle Obama and other leaders in the private sector came together to discuss strategies for solving childhood obesity in the United States. Executive Director of FC Harlem, Irv Smalls presented as part of a panel that focused on the importance of physical activity. Shellie Pfohl Moderator and Executive Director for the President’s Council on Fitness, Sport and Nutrition highlighted the success of FC HARLEM’s ability to leverage the public and private sector to develop fields in NYC where land is hard to come by or very expensive. Shellie hopes to visit the FC Harlem in 2012.